1) What was it like to leave your civil service job as a teacher and venture into business? It was very scary. Leaving that ‘iron ricebowl’ behind, I had to fork out my own capital and for 1 year, I had no pay as the business was not able to sustain a salary for me then. This was only possible because my wife agreed to be the sole breadwinner for about 1 to 2 years. It was just a feeling then that I had to try something on my own, at least once in my life, I had to give it a shot. Even if I failed, at least I can say that I tried. 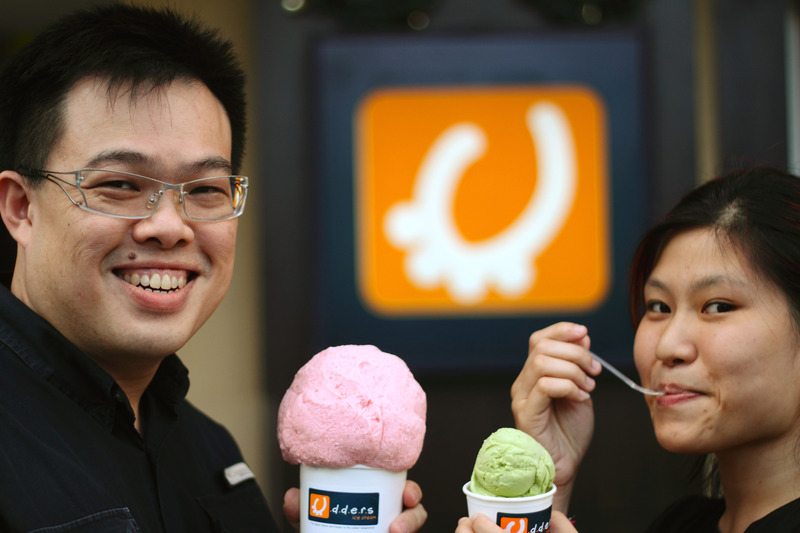 2) How do you differentiate Udders from the other ice cream brands in the market? We specialize in liqueur ice creams – our strength. Three and a half scoops of our Rum Rum Raisin ice cream has the same amount of alcohol as a can of beer! This flavour was designed to overdeliver the rum. It is different from your typical Rum & Raisin, which uses rum flavouring only. It’s an ongoing quest as we try different ingredients and strive to come up with a new flavour every month and improve on the existing ones. We now have 30 flavours. 3) What are some of Life’s lessons or business lessons that you’ll be sharing with your children as they are growing up? Firstly, have high standards in everything that you do. That’s how we have gotten so far. Secondly, be careful of who you trust. Being played out by people can be devastating. Also, you must have emotional stability in order to take the knocks. The first 6 months in this business was depressing as nobody knew about us, and there was bad news almost every other week. During the first couple of months, I felt like giving up. But it’s a good thing we persevered as we knew we had a good product. We had no publicity then. It was only through the customers who tried our ice cream and gave good feedback that we knew we just had to wait it out. Till today, we’ve not spent any money on advertising. 4) Your ice cream is ‘happy food’ for many people. What makes you happy? To see my business go overseas. My aim is for Udders to go overseas. Family and friends also make me happy. No matter what you do in business, you need a group of people who will always be there to support you. 5) What ingredients do you think are needed to make a relationship sweet like your ice cream? Respect. Appreciation. The desire to improve for the other person. In my business, I’d only want to delve into franchising overseas. Locally, it’s a definite no-no. This is because my staff are special to me. We go out of the way to take care of our staff. One thing that I insist on in our company culture is that there be no ‘politics’. And we really strive to achieve this. I’ve noticed that many people who join us have been hurt or bullied in their previous companies. Hence, we offer a safe place for them to improve, and in a way, to heal. For instance, there is a staff member who was bullied in his ex-company and his few months there were torturous. He was so fearful when he came over, especially during the first few days. But within a week, I could see happiness showing in his expression. In my monthly management meetings, I mention without fail the ‘5 Dysfunctions’. [Read ‘The Five Dysfunctions of a Team’ by Patrick Lencioni] The first dysfuntion is the ‘Absence of Trust’. I value trust in my company, such that people can tell each other secrets and know that there will be no betrayal. When I hire a full-timer, I tell him/her “We must be able to trust you. If not, you leave the company.” When there is trust, people can do things, say things and voice their opinions in a safe environment. Also, there needs to be a feedback system. We encourage people to give feedback. This is 2-way – from me to my staff, and from my staff to me. When I do something wrong, my staff will tell me straightaway. If it makes sense, I’ll tell them “You’re right, I will change”. Important to me is also the social dimension of our company. We are currently supporting two of our staff through their University education by paying for half of their tuition fees. They are from a poorer background and they deserve to further their education but can’t, so we help them. We are also looking for a charity to support and give them a percentage of our profits. Grace says: This is the first phone interview I’ve conducted. And it’s so very different from the usual email interviews. David was shuttling between 2 outlets as we spoke on the phone yet I could hear his passion about his product (“Have you tried our Rum Rum Raisin?”) and the ‘heart’ his company has for their staff. I am impressed at how David is so bent on running a company that has no politics and I think he not only has the right formula for putting together good ice cream, but also for creating a great company to work in. Look out for: The interview with Jim Lim, Singapore’s celebrated composer, on 18th February 2011. This entry was posted in Food and tagged Ice cream by Grace Tan. Bookmark the permalink.